Unique Iron Paint, is a two part finishing process that can be applied to most surfaces, such as stone, wood, plaster, MDF board, Hardy Board, Metal, etc. The Iron paint is applied with a brush, just as you would with normal water based paints. Once this paint has dried for between 4 to 8 hours (depending on temperature) the second part, is applied. This second part is the oxidizing agent, which is a corrosive chemical, which will rust the iron painted surface, thus creating a real rust look. Additional effects like patina can be added afterwards. *NEW* Small model kit size NOW AVAILABLE. Go to the link "Rust Paint Fact Sheet" in the link bar above. 1 Prior to applying "Unique Iron Paint" make sure the surface you are coating has been thoroughly cleaned as you would any surface before painting. Make sure it is free from dust and other contaminants such as grease or oil. 2 The Iron Paint can be painted or rolled onto the surface. The technique you use during this process can greatly determine the final effect of the finished creation. As Iron paint contains contains a special iron, brush strokes will leave fine lines in the finished work. If you do not want this effect, you can either use a small roller or use the end of your brush in a stippling manner. (hold the brush like a pen and using the end of the brush, go over the finished work to leave a uniform finish) It is best to do small areas at a time, before the paint starts to dry. One coat should be sufficient if applied evenly and liberally. 3 Once the paint has dried sufficiently to be touch dry, depending on temperature this could take anywhere between 4 to 8 hours it is ready for the second treatment. The oxidizing agent is sprayed onto the paint surface to start the iron rusting This is real rust, not a paint effect. Just as sea water rusts iron, so will your creation rust. The Oxidizing Agent we make speeds up the rusting process to a few days rather the weeks. To maintain an even rusting pattern, it is advisable to places your piece in a horizontal plane. If placed vertically the oxidizing agent will run and leave streaks on the piece. 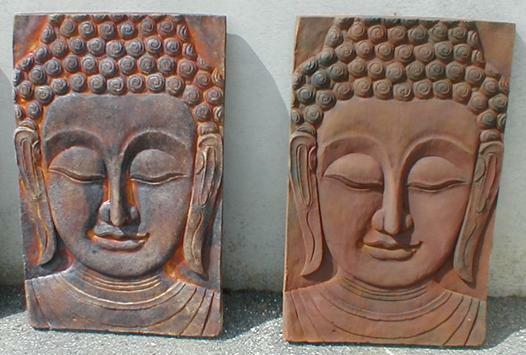 On the photo on the right, these streaks can be seen on the left check of this Buddha Plaque. When placed outside your rusted piece will continue to rust further and become darker as with any rusted piece of metal. 4 The Iron paint is available in 1 and 4 liter jars. Larger quantities are made to order. Coverage is depended on the type of surface the paint is being applied to. As a general rule 1 litre will cover approx 9 square meters. You can make it stretch further by applying thinner coats, but this could leave an uneven/patchy rust finish. 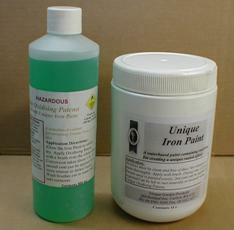 To order please go to the"Rust Paint Fact Sheet" link, listed above next to the contact link. 5 The Oxidizing agent will leave a small amount of patina on the finished product, however this can not be guaranteed. If specific patina areas are required, patina paint (copper) can be applied on areas where you want the patina highlights. The same oxidizing agent will react with both the copper paint and the iron paint to give a rust and/ or green patina finish. 6 Below are 2 views of the statue "Juliette". 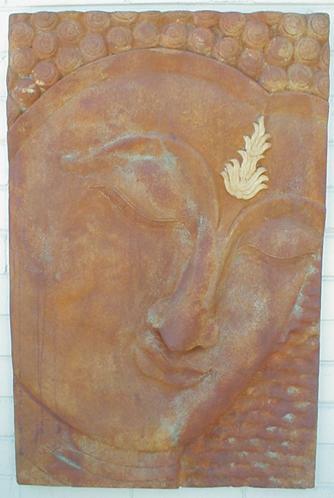 This life size statue, (155cm tall) has been rusted, using the Unique Rusting Paint, and highlited using our copper paint. The "natural" weathering effects can be seen in the 1st Photo, with the patina highlights on parts of her hair, hand and on the fabric drapped around her waist. 7 Different effects can be achieved by light or heavy spraying of the oxidizing spray, or by applying additional coats of spray, as demonstrated on the two large plaques on the right.